Northwave has announced the launch of a new range of offroad shoes, Ghost Pro, at Eurobike 2018. 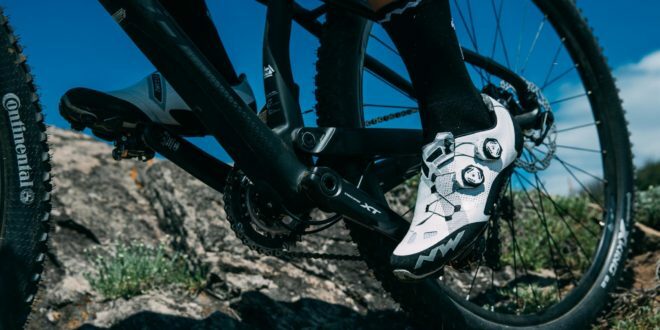 Planned as part of Northwave’s 2019 collection, the Ghost Pro shoes will use a new incarnation of the existing XFrame technology. X Frame 2 offers a double SLW 2 dial claimed to optimize fit and enhance power transfer for mountain bike riders. The shoes will also be fitted with the unidirectional carbon fibre Hyperlight XC outsole – co-developed with Michelin Technical Soles – inspired by the same technology used by the Michelin Wild Race’r mountain bike tire. Alongside the Ghost Pro shoes, Northwave has also announced the launch of a new bibshort and jersey range, Sense, as part of the 2019 collection. Using made-in-Italy fabrics with quick-drying properties, the bibshorts and jersey will both offer UPF50+ UVA protection. Both the bibshorts (RRP: 109,99€) and jersey (RRP: 79,99€) will be available in graphite, with the latter additionally offering red and blue as colour choices. The Ghost Pro shoes (RRP: 379,99€) will be available in both black and white. Find Northwave at Eurobike stall A7/301. Next Fulcrum announces range of e-MTB specific wheels.